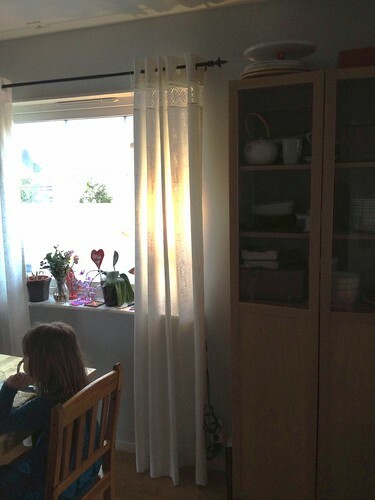 I finished our new curtains for the kitchen last night. I made them floor length this time and I like the change. Since we moved in here 6 years ago I think I've made new Spring curtains every year (brand new or updated the previous year's). I like the change from the brown winter/Christmas curtains to these who let in more light. We'll get a new rug for the dining area in two or three weeks and when we do we'll update the chairs as well. These were bought at a flea market 5 years ago and they are mended and scuffed and generally not what I wanted to begin with.